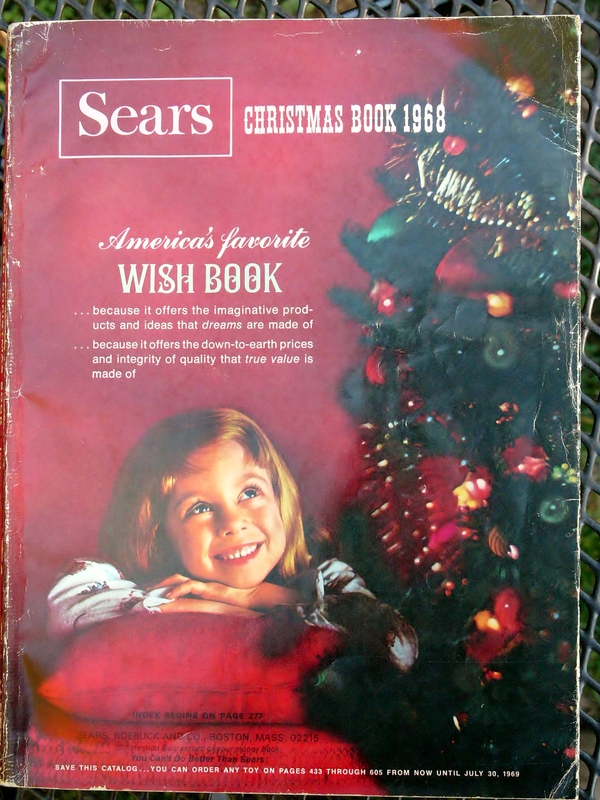 The arrival of the Sears Christmas catalog in our household inspired an array of emotions and behaviors – excitement, confusion, secrecy, sorrow, but most of all, fascination. 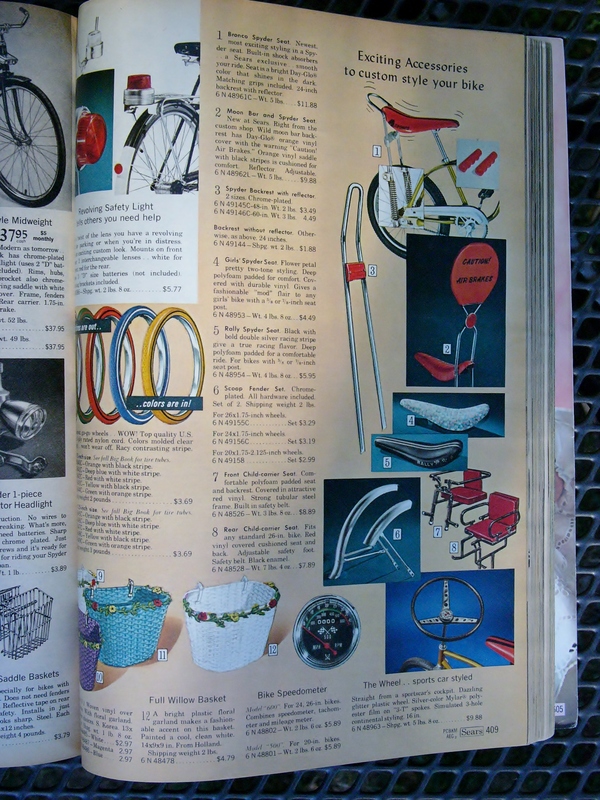 The catalog was huge, and packed with every kind of consumer good that a child (or adult) could imagine – electronics, entertainment, books, toys of all kinds, sports and hunting equipment, power tools, clothing, and of course, bicycles. 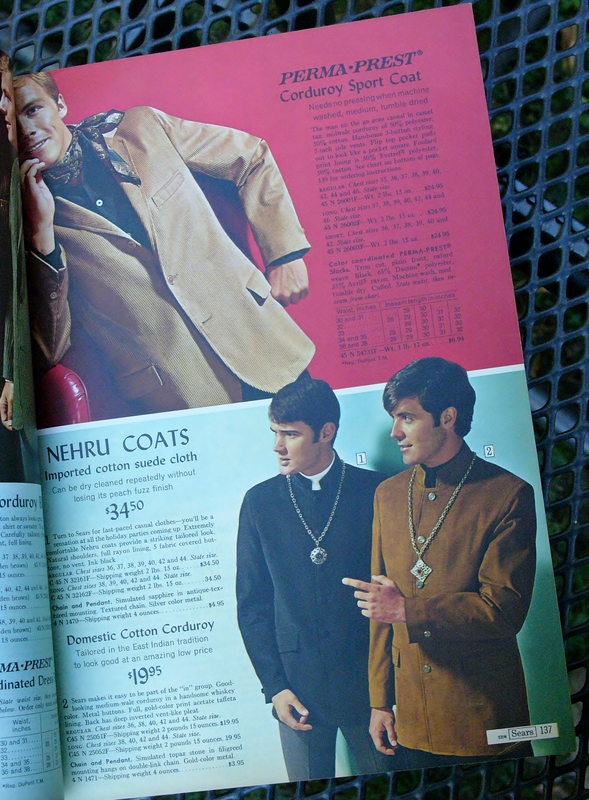 Nehru collars and fancy scarves…sweetly gay! So, in a nostalgia moment, I recently acquired a 1968 Sears Christmas catalog on eBay, which was in surprisingly good condition. 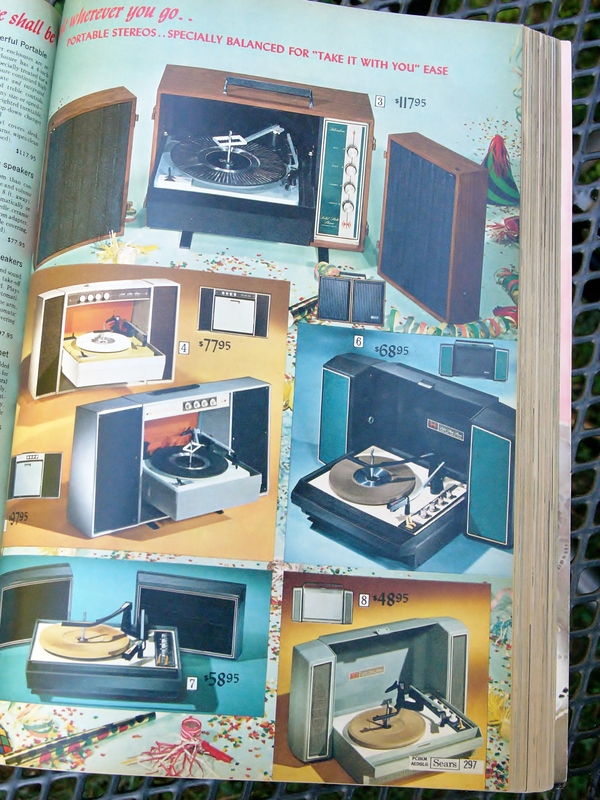 I have been enjoying perusing the pages and studying the specifications, as well as noting the pricing on many of the items in the catalog – very high given the wage and price levels of the 1960’s. 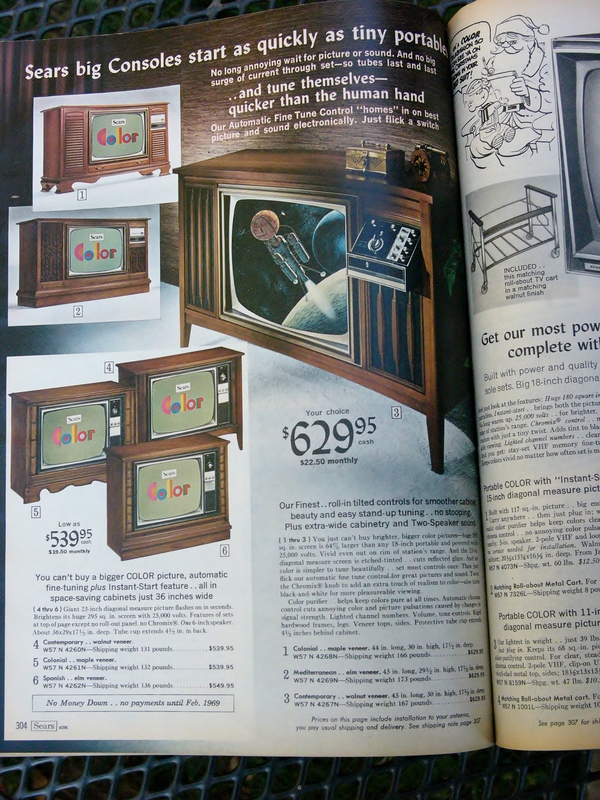 The color TV console pictured above (with awesome NASA spacecraft featured on the screen) is listed at $629.95. That translates into $4,314 in today’s prices. Similarly, a desktop Hi-Fi with detachable speakers went for $117.95, which would be $808 in 2015. 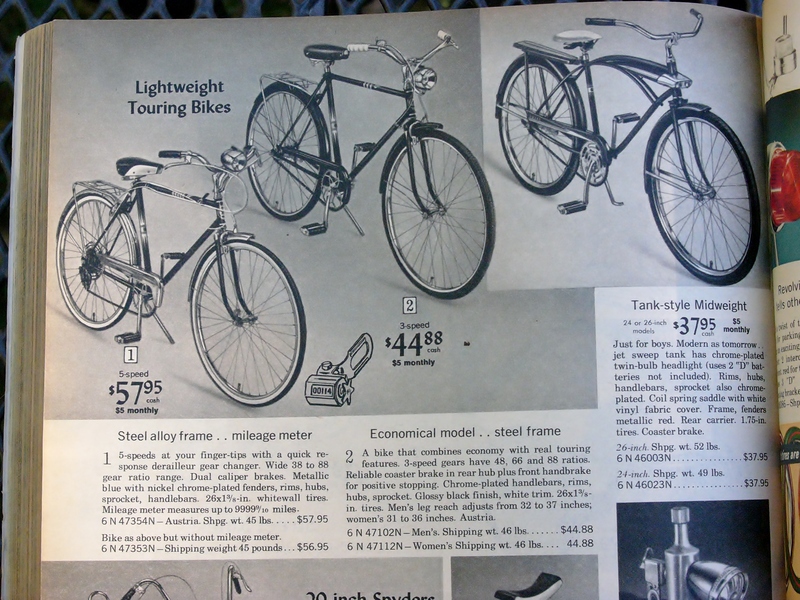 The highest quality bicycles in the catalog are those listed above – “touring” bicycles, made in Austria for Sears by Puch. The 5 speed bike has a gear ratio of 38 to 88, according to the specifications, and includes caliper brakes, chrome fenders, rims and hubs, a rear rack and headlamp. The $57.95 price would be $397 in today’s buying power. That seems quite reasonable, and definitely at odds with the prices of the electronics in the catalog. Manufacturing efficiencies for bicycles were much more fully realized, having been around for nearly 80 years at this point, even though low wage manufacturers such as Taiwan and China were not serious players at this point in time. Accessories included multi-colored tires, proving once again that there is nothing new under the sun, for the most part, when it comes to the world of bicycle manufacturing. After all, index shifting was first introduced in the 1930’s, and while many components have been perfected and tweaked over the decades, the basic design of many cycling components has remained unchanged. Derailleurs are a good example of this. 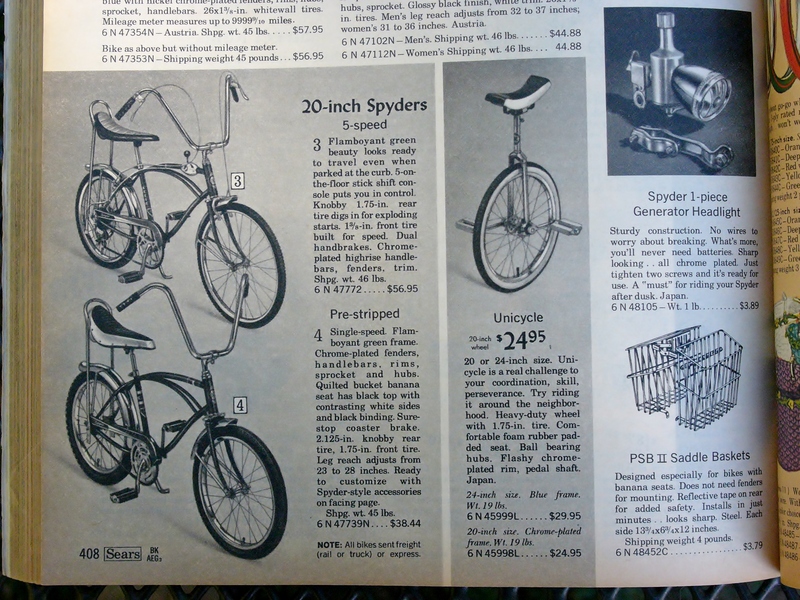 Sears was not a company to miss out on trends, so these “Spyder” bicycles are prominently featured in this two page spread, and in the photo below. These were comparatively expensive bicycles – costing more than the top end touring bike, with the highest end model going for $534 in today’s prices (again – not bad). With their suspension and rear knobbies, these bicycles seem more ancestral to the mountain bike craze than the Schwinn Excelsior modified by Joe Breeze. One of the higher-end models was an auto-shifter with 5 speeds and dual rear brakes – wow! The ten speed model was also built with dual rear brakes, and maybe that’s why us kids thought we should blast down hills as fast as possible – something I did on my own green sparkle model! Raleigh had its own version – the Chopper, which was designed for popping wheelies, and had smaller front wheel, but also included the ape hanger bars and sissy bar saddle. The Raleigh version is now highly sought after as a collectible bicycle, whereas the Sears Spyder models are not so much. However, the Sears-Puch 5 speed touring bike was a decent machine for what it was, and there are still enthusiasts out there who appreciate them. Here are some color photos on an enthusiast’s Facebook page for your enjoyment. This entry was posted in Bicycle restoration, Vintage bicycle, Vintage touring bicycle and tagged 1960's bicycles, Puch, Sears bicycles, Sears Puch by Nola Wilken. Bookmark the permalink. Cool! It’d be fun to see all the bicycle pages in the catalog, if you get a chance! 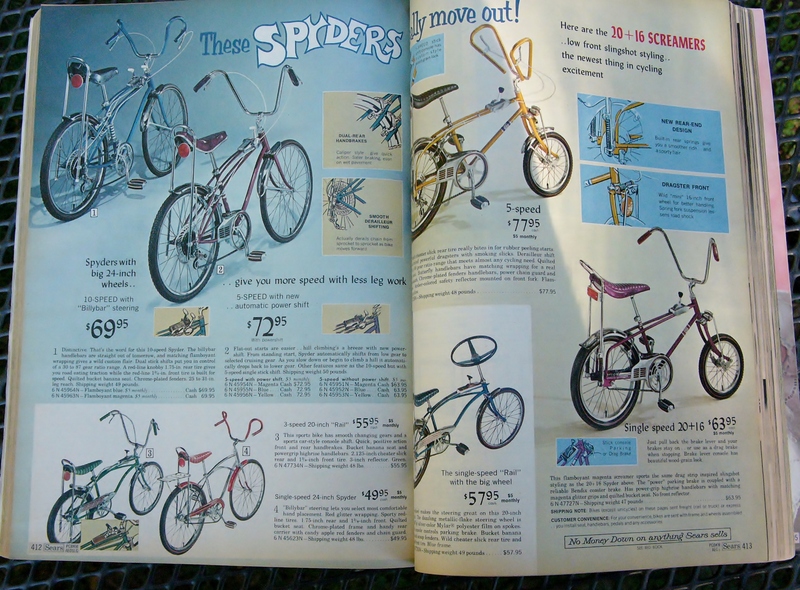 Believe it or not, there are only two other bicycle pages – one with little bikes for tots, including training wheels, and a page with “girls” Spyders. I was surprised at the narrow range of models and accessories offered, but this was the Christmas catalog, so it appears that the bicycle offerings were targeted mainly to kids. Oh man, I wanna see that page with the girl’s bikes! We just picked up a girl’s Spyder, and I **THINK** it’s a ’68. Are you still watching this post? Any chance you could check that page for the 24-inch girl’s single-speed Spyder, and see if the model number is 45632? I have a 1968 Sears bike, missing a few parts, but mostly complete. This catalog was very helpful in identifying it.